Despite never being much of a sports fan as a child, as a young adult I became a huge fan of the NFL, particularly of The Atlanta Falcons. Doing so later in life, and as someone with an over-analytical tendency, has resulted in my viewing the experience as an experiment of sorts. One in which I observe and reflect on patterns even as I participate in them. One of the strangest aspects and one I am deeply affected by is that of team loyalty. Sports has within it, the strangest of snobberies – one that centers around team loyalty. Watch some time as a team rises from the ranks towards a championship and their fans seem to multiply. You will see new hats and jerseys on the street and every day there will be new converts. But many of them will be chastised as fair weather fans. Their fandom somehow less than that of others that watched the team faithfully even when they were not good. Worse yet, the bandwagon fans. Those people that rooted for another team and changed their mind when the present team started to look better. Those fans are slime and true fans will make sure to tell you that. We watch people throw (or kick, or bounce) a ball (or puck or frisbee) because we enjoy it. We chose to invest some of our time in observing an event with unpredictable outcomes because we like the experience of it. If what we enjoyed was watching a winner win – consider that the optimal way to do so is to watch games on a delay. Or perhaps whole seasons – I sure hope the Broncos pull it off this (last) year! Sure, some people might enjoy watching good plays – but highlight reels can provide that much more effectively than following a team. Judging by T.V. schedules, live sports are much more popular than reruns. We watch sports for the excitement caused by the unknown. We like the highs and lows that we experience by investing ourselves in the outcome. We love those that root for our team and we despise those that root for our rivals. So why should there be a bias in terms of length or timing of fandom? Why should we care about fair weather or bandwagon fans? As I said above, we invest a little bit of ourselves in the outcome of the game when we root for a team. Having been through a few big wins and losses (more of the latter) I can say that intensity is magnified with investment. When the Falcons lost the 2012 NFC Championships to the 49ers, I walked home from a San Francisco bar where I had been the lone black jersey. It was a close game that the Falcons had led from the start, only to come 10 yards short (on a clear bad no-call). The disappointment had me paralyzed. I got home only to collapse on the couch and wallow. It took me a day to get out of it. All of that and I had only been a fan for a few years. I have seen much worse in friends that are more intense fans -those that spend thousands of dollars on season tickets – those who have made the team a part of their core identity. What I have noticed is that the intensity of feelings do not seem to magnify equally on either size of the outcome. Losses are felt much worse by those that have invested more, where as wins seem to be shared by all with near equality. I think this is why loyalty snobbery exists. The loyal fans understand that if their team wins, everyone will celebrate joyously, but if their team loses, the fans that have invested little, will move on quickly, while they are left themselves to wallow in defeat. When the team gets bad and the loyal fans still go to the games and cheer, knowing their chances of success are low, they think about the future in which they will win and invest emotion in it. That hope carries them through defeats. Of course they are bitter that there are people that are out there not watching, only to swoop in near the finish line and celebrate alongside them. They feel that their hard work rooting for the team during the bad seasons entitles them to something else. Fair weather fandom seems to be the best way to maximize enjoyment. Pick a bunch of teams you like in various sports – perhaps your home town teams, your college, where you live now – and root for whichever ones do well on any given year. Maybe it is your home town NFL team one year and your college swim team the next. You could pick based on pre-season projections – or just wait until the post season to pay attention at all. If you root for teams only when their chance of success has increased from 1/32 to 1/12 and you have nearly tripled your chances of success. If sports fandom centers around investing emotion in hopes of returns of highs when the team wins – why don’t we treat it like other investments. A diversified portfolio is a no-brainer when investing money – so why should it be any different when investing in the outcome of sports matches? This is the third post in a series about my fantasy football auction strategy. I first wrote about the strategy here. Then after the season I started with part 1 of the retrospective. In this final post I have a few other thoughts that I’ll share. Below are the positions each team ended in and the difference between their expected and actual results. We can see that in general, teams that predicted well on draft day performed well in the season. The r squared for the linear trend line here is .63 which means that for my seasons we can contribute about 63% of the final results to draft performance. What accounts for the other 37%? I would simplify the decision types in fantasy football by describing three. Looking back at my draft I realize that I optimized for a scenario where the draft accounted for >90% of the final results. I assumed a greater level of predictability than was possible and minimized the importance of in-season transactions. I also created a coaching nightmare for myself. Thinking about in-season transactions, it is important to understand how many players went undrafted but ended up being extremely valuable. In fact of the $1,945 of actual skill player value my league saw, only $1,553 was drafted. About 75%. Knowing this we can see that trying to draft a team with a lot of mid level talent can actually be detrimental. 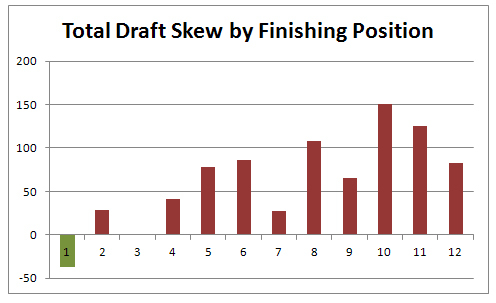 Lets think back to my scenario where some teams drafted 10s & 1s, while I tried to draft only 6s & 7s. We now know that 25% of the value of the season had yet to be discovered. Many of those were 5-7s though Knowshon Moreno was arguably a 9. On my team of 6s & 7s I had a hard time acting on the emerging talent because it meant giving up an equal player from my team. Another teams with some 1s however would have easily given up those duds for a mid level prospect. The pre-draft % of money spent I had allocated to starters was 90% of my budget. Next year I’m going to consider spending all of my money on 70-80% of my team, knowing that I’ll have a few duds in there for the first weeks, hopefully to be quickly dropped for emerging talent. All of the above analysis optimized for regular season performance. Unfortunately, fantasy football, like real football isn’t all about the regular season. On Sunday we saw how a team with a great regular season performance could blow it in the championships. The same happened in our fantasy league. The team that crushed it all season lost in the finals. So as I think about a strategy for next season, that is one more factor to take into account. Last August, before fantasy football season started, I came up with a strategy to approach the auction draft my work league was having. My season is now over, I didn’t make the playoffs, so I want to take a look back at that strategy to see what I can learn. The important part of this analysis is figuring out how much of my poor performance I should attribute to my draft strategy and how much to other factors. The first thing I want to evaluate is my decision to ignore defenses & kickers in the draft. I instead focused my draft strategy around skill players; QB, RB, WR & TE. I did this because I planned to employ a method called streaming. This involves picking up and playing people based on their match-up each week instead of relying on one team. Over the 13 week season I played 8 different defenses. My total score for defenses was 281.6, an average of 21.6 points per week. (FYI – We have crazy defensive scoring) That would be the #10 ranking defense in the league – after accounting for bye weeks. The #2 defense averaged 24.97 points per week though, so the difference is negligible. Going forward, I’ll continue to stream defenses. As I get better at it I might even be able to beat single team scores, I noticed that most weeks one of the top three highest scoring teams was available. The maximum possible streaming score was much higher than the maximum possible single team score. Over the same 13 weeks I played 6 kickers. My total score was 85 which would be the #28 ranking kicker. There were only 6 that did worse. This clearly wasn’t the right way to go. However, the difference between my score and the first place kicker was 4.5 points per week so this isn’t horrible, but certainly didn’t help. I think next year, I’ll avoid streaming and instead focus on grabbing a kicker from a high scoring team and sticking with them. That seems to pay off more and offer more predictability. Now that I have some insight into my decision about drafting for the D & K positions I can evaluate my approach to drafting skill players. The strategy I employed was to optimize for value. I wanted to get the most points for each fake dollar I spent. I based this strategy on the idea that players are interchangeable commodities and that it was better to avoid hyped and price inflated stars and to instead grab people that were undervalued. I had hoped that most teams would draft a few stars and then only have enough money remaining to scrape the bottom of the barrel, leaving me to grab a team full of upper-middle tier players. To state this mathematically, I thought most teams would consist of 10s & 1s, for an average around 5-6, while I’d have a lot of 6s & 7s, for an average of 6-7, thus a slightly better team overall. 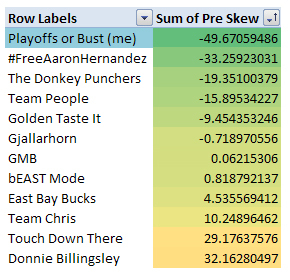 To figure out value I used some projections that football experts had put together about how many points each player would score during the season. After the draft I evaluated my team based on the projections I used. I compared what was paid in the auction with the pre-draft valuations I was working off of. It looked like I had crushed it. In the table below, positive numbers represent overpaying and negative numbers represent underpaying. I had gotten 25% (~$50 of $200) more team than I should have and if my numbers were right that should have resulted in an awesome team. The major flaw in this system is that it is heavily dependent on the accuracy of the projections I used. In a world where those were mostly correct, I would have fared well. Reality however is very hard to predict. Now that the regular season is over and I have actual point values, I reevaluated the draft using the actual production of players rather than their projected stats. The second column compares the price paid by each team with their actual season production. It turns out that my draft was basically a waste – $150 of the $200 fake money I spent did not help me. I of course generally knew this, having suffered through the season, but it is interesting to see the exact figures. I would love a simple explanation. To be able to say that based on those results, my draft strategy didn’t work and I should not try it again. Unfortunately, a single season of football doesn’t have enough data to evaluate a strategy to an acceptable level of significance. Fantasy football has the rare ability combine a low sample size with high variability. Football is contact sport that creates often unpredictable injuries & this season was particularly injury heavy, especially for high profile skill players. Injuries can and do happen to anyone. This leaves me speculating whether the players I drafted were available for value because people knew they would get injured or if I just got a run of bad luck. Often predictions will take this into account, but the consensus stats I used were only concerned with averages, not standard deviation. In the future I would be wise to account for that as well, and probably to come up with a few additional risk factors to account for. When drafting, risk is a fine thing, as long as it is balanced with some stability. As I think about risk, one factor that I have data on now is risk by position. We can take a look at this season and see how each position played out. The chart below shows skill positions and how the drafted players in my league on average lived up to pre-season expectations. We can see that RBs & QBs really dropped the ball this year. Of course, this won’t come as any surprise to anyone that drafted CJ Spiller, Ray Rice, Doug Martin, Trent Richardson or Arian Foster. In fact, Matt Forte & Demarco Murray were the only RBs, of the 24 with the highest draft price in my league, that performed better than their draft price would indicate. Meanwhile TE was a gold mine. On average every dollar spent there paid handsomely. Especially Jimmy Graham. I need a few more seasons of data to see if these are conclusive results. But, common fantasy football knowledge defends that RBs are more injury prone though which turned out to be true this year. If that remains true, what it means for future seasons is that drafting high on WRs will have more lasting value on average. RBs will always be available on the waiver wire as the season progresses and injuries occur. I also plotted the difference in actual to expected performance by team to see if there were any trends there. The two that panned out the worst were Buffalo & Atlanta. Buffalo because of CJ Spiller who was the only drafted player. Atlanta because of the complete meltdown that team saw including injuries of Roddy White, Julio Jones & Steven Jackson (which resulted in a poor season for Matt Ryan). From what I can tell, looking at a player’s team isn’t a great indicator of success. Neither the team’s win/loss record or their improvement over expectations seems strongly correlated with the success of the fantasy players on the team. Examples include Denver who was an early favorite, but has done even better than expected, Cleveland who is 4-8, but has had a few players pan out, and finally Kansas City who has turned their team from #32 to #2, but not to the benefit of many fantasy owners. The methodology I used to do this analysis has some flaws that are worth noting. I made the trade off of using a less rich analysis so that I could complete it faster. The figures I analyzed are based off of the total points a player scored during the season. I have not taken into account the week to week scores. This creates a few edge cases and masks the true value of certain individuals. For example, players that performed well up until an injury will appear undervalued and players that were inconsistent might appear overvalued. Thinking about injuries, Aaron Rodgers for example had a great season through week 8. He sustained an injury in week 9 and hasn’t played since. In reality he would have been a fine QB with high value during the first 8 games. I have yet to take this into account and it is worth noting in future analysis. Looking at consistency, a player like Dwane Bowe who was likely overvalued in my analysis. In Bowe’s first five weeks he scored; 3, 11.6, 0.4, 11.8, 3.5. That level of variance was incredibly frustrating for a fantasy player. In my analysis I would have valued him the same as a player that got 6 points every week. In reality they are much different. In the future I would like to take this into account. (This might value RBs a bit higher as they tend to be more consistent where as WRs can see high variance due to big plays and TDs. This year I based my projected values strictly off of projected points, optimizing for maximum points throughout the season. Knowing what I know now, next year I want to incorporate more with consistency ratings. I have realized that the worst thing is not a low scoring player, but a player who brings high and low scores at unpredictable times. Continue reading my analysis in part 2 here.